Motherwell's fine recent run was ended in a disappointing 1-0 home defeat by Aberdeen on Sunday. Motherwell were outstanding in beating the Dons 3-0 in a Betfred Cup quarter-final on Thursday, but this time Aberdeen showed a toughness sadly lacking in the cup tie. Before kick-off in this live BT Sport clash there was a minute's applause for Motherwell legend Bert McCann, who died this week at the age of 84. The Dons appeared much more up for this game and bossed possession early on. The first chance of a turgid opening spell came for the away team after nine minutes when fans' favourite Cedric Kipre was dispossessed on the far touchline by Stevie May who advanced and shot just wide of Trevor Carson's right hand post. Aberdeen defender Andy Considine had a header saved by Carson and then the same player nodded wide following a Ryan Christie free-kick. 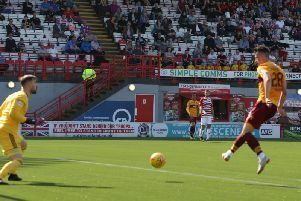 Prolific Motherwell marksman Louis Moult's first sight of goal saw him shoot over from outside the box on the half hour, before a low driven corner by Gael Bigirimana set up Motherwell skipper Carl McHugh for a low effort which was saved by Aberdeen keeper Joe Lewis. McHugh shot wildly wide following a Chris Cadden throw-in, before Motherwell went agonisingly close to taking the lead when defender Peter Hartley shot just wide after Allan Campbell's cross had been flicked on by Charles Dunne. McHugh was booked for an early second half foul on Christie and the hosts almost went ahead on 53 minutes when Bigirimana set up Cadden for a shot that was saved by Lewis. Hartley sent a looping header just over from a Cadden corner before the Dons broke the deadlock against the run of play in the second half. Considine bundled the ball in to put Aberdeen 1-0 up on 57 minutes after Christie's shot had rebounded off the post following an initial touch by Stevie May. Motherwell manager Stephen Robinson - so often lauded for his effective substitutions in the past - made a double change on 59 minutes when he sent on Elliott Frear and Alex Fisher for Richard Tait and Ryan Bowman. And Robbo's final substitution saw Craig Tanner introduced for McHugh after 71 minutes. Frear advanced well down the left on 77 minutes, but he failed to pick out Tanner in the centre as a great chance was wasted. Aberdeen sub Greg Stewart then forced Carson into a fine save on 85 minutes. There was a late penalty shout for Motherwell turned down when O'Connor appeared to barge Moult over. Although Motherwell huffed and puffed in the dying stages, they couldn't find an equaliser and Aberdeen - time wasting at regular intervals - held on for a dogged victory.